Its only 4 weeks until Easter guys and this year we are holding a mega Easter raffle to help raise money for our rescue horses. We are still trying to raise the $6000 for Chicky and Whiskey's surgery which we have raised just over half so far and with our other vet accounts being over $2000 and now Marley needing to go to the horse hospital which will cost about $3000 as well we are needing help more than ever. First prize is a massive basket filled with Easter eggs and goodies. 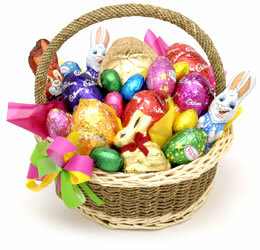 Second prize is a small basket filled with Easter eggs and goodies. If you would like to buy a ticket and help raise money for our beautiful rescue horses please deposit money into the account posted below and use your surname and the letter "EB"
It is extremely important that you use the reference "EB" so we can put your deposit to this raffle. Will be drawn on the 16th of April which is one week before Easter and winner announced on this website.